The globe artichoke (Cynara scolymus L.) is a perennial herb cultivated in the Mediterranean region and the Americas for its edible immature flower heads (inflorescence). It belongs to the sunflower family, Compositae (Asteraceae).The French, Italians and Spanish are the leading growers and consumers of artichokes. 99% of the crop grown in the US is grown in California. It’s a green, cone shaped, immature flower head or unopened flower head with several overlapping, green outer leaves, that are tough and inedible at the tip, but fleshy and tender at the base, and edible. The shape of the artichoke head varies from spherical, to oval-shaped to cylindrical. Spherical or oval shaped are preferred. Surrounding the immature florets are a light coloured cone of immature leaves which are edible (see the part marked green). 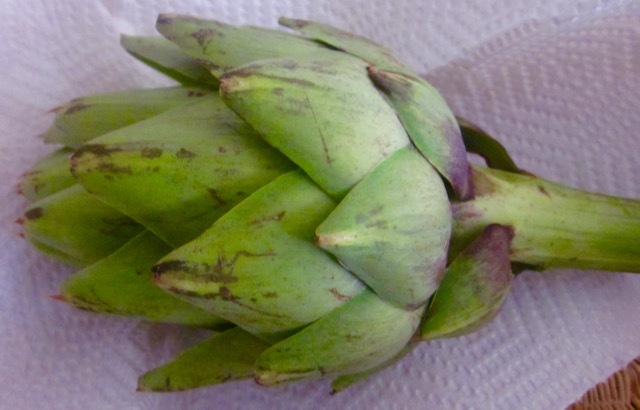 When the artichoke head is still very small and immature, it can be eaten whole, after trimming. At this stage it’s referred to as ‘baby artichoke’. The baby artichokes are commercially sold canned, as “artichoke hearts’. Artichokes heads vary in size. The smaller ones are known as ‘baby artichokes’ and weigh about 60g (2oz). They are completely edible but must be trimmed. They are often marinated and served in salads or in hot or cold antipastos. The largest heads weigh 500g (pound) or more and are best stuffed with a savoury filling after trimming the inedible parts. The medium sized ones are recommended for eating with sauces as an appetizer. Artichoke is a delicacy, eaten bit by bit, by hand, and served hot or cold. It can be served whole or trimmed down to the heart, which is the tastiest part. It’s usually served with liberal amounts of melted butter. The artichoke head may be baked, fried, boiled, steamed, microwaved or stuffed and served hot with various sauces like hollandaise or melted butter or served cold with vinaigrette. In Italy, small immature artichoke heads are cooked and preserved in olive oil. In Spain, the more tender, younger, and smaller baby artichokes are preffered. More than 2/3 of the artichoke grown is consumed fresh and the rest is canned or frozen in the form or artichoke hearts (baby artichokes) or bottoms. Artichokes are harvested all the year round with peaks in the spring, from March to May.